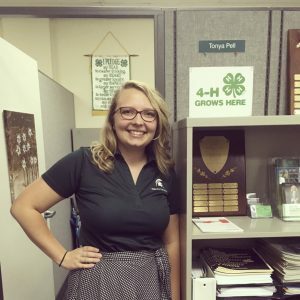 Muskegon, Mich. – Michigan State University Extension is pleased to announce the appointment of Tonya Pell as 4-H Program Coordinator for Muskegon County. Most recently, Pell served as 4-H Tech Wizards Youth Mentoring Program Coordinator in Muskegon County. As the 4-H Tech Wizards program coordinator, Pell established program sites at schools throughout Muskegon County which provided mentors and mentees the opportunity to work together on STEM (Science, Technology, Engineering and Math) projects. In her new role, Pell will serve Muskegon County as the 4-H Program Coordinator. “I am thrilled to have the opportunity to work with the youth participants and volunteers that are so important to the Muskegon County 4-H program. Muskegon County has a very strong 4-H program and I intend to continue our efforts to expand the reach and impact of the 4-H program in Muskegon County,” Pell said. Pell is a graduate of Central Michigan University and has a Bachelor’s Degree with a double major in History and Women’s Studies. 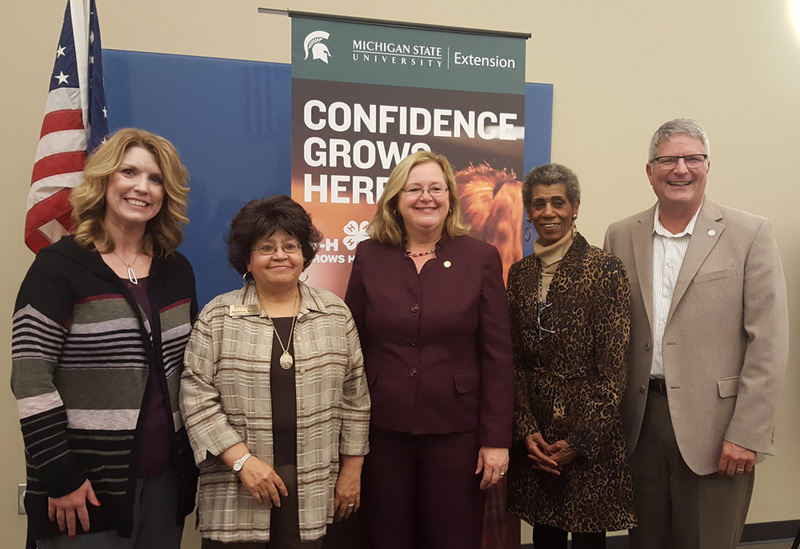 For more information about Michigan State University Extension, visit www.msue.msu.edu. Those interested in learning more about joining or volunteering for 4-H, Tech Wizards or any other Michigan State University Extension program can contact the Muskegon County Extension office at (231) 724-6361. This entry was posted in 4-H on January 8, 2018 by editor. 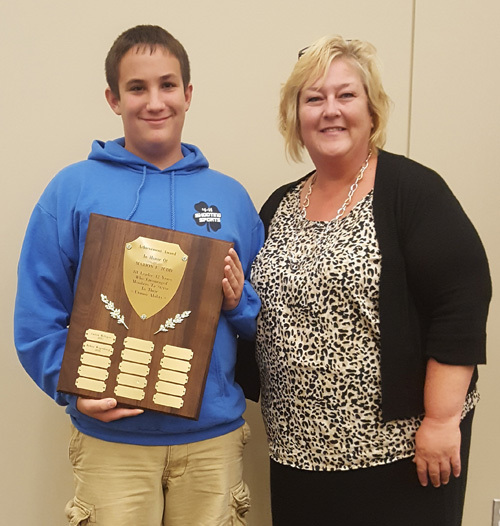 The 2016 Muskegon County 4-H Awards Ceremony was held on October 3, 2016 at the Muskegon Area Career Tech Center. Approximately 190 4-H members, volunteers and parents were in attendance. The night was spent recognizing 4-H members and volunteers for their accomplishments and years of service during the 2015-2016 4-H Club Year. Representative Holly Hughes, Senator Goeff Hansen, Muskegon County Clerk, Nancy Waters, and Muskegon County Commissioner Wilkins was in attendance as well. 4-H county medals are given to 4-H members who have greatly improved their skills in a particular project or projects or whose project involvement has been significant and successful. Up to 2 medals from each 4-H project area are awarded each year. This group of 4-H members has finished their 4-H journey. It is my hope that the skills they have acquired in 4-H will remain with them throughout their life. Thank you for being excellent role models for the younger 4-H members in this county and I wish you the best of luck in your future endeavors. The 2016 Muskegon County 4-H Leaders Council Community Service Award belongs to the Busy Bees 4-H Club. Some of their community service projects included donating 6 cases of water for delivery to those in need in Flint, a community garden at the Covenant Community Church, helped serve breakfast at the First Congregational Church, and assisted with the Food Truck at the Covenant Community Church. The Busy Bees 4-H Club strives to help others in their community. This shows the 4-H members the value and need for service to others. The Busy Bees 4-H Club meets in Muskegon. The 2016 Horse Sportsmanship Award goes to Tessa Rush. The Horse Sportsmanship Award goes to a 4-H member who exemplifies outstanding sportsmanship during the 2015-2016 4-H Club Year. Tessa is from Spring Lake. The 2016 Marion Judd 4-H Award goes to Bobby Wagenborg. The Marion Judd 4-H Award was established by the Muskegon County 4-H Leaders Council in memory of Mrs. Marion Judd, who served as a 4-H club leader for over 40 years. Mrs. Judd took special pride in recognizing those 4-H members who showed the greatest personal growth and improvement in their 4-H projects and activities. Bobby is from Coopersville. The 2016 Friend of 4-H Award belongs to SAF Holland. The Friend of 4-H Award is awarded to an individual who has provided significant contributions and assistance to 4-H programming and is not presently enrolled as a 4-H leader. The Charity Committee at SAF Holland made the decision to give their earning from the company picnic to the Muskegon County 4-H Make the Match Endowment Fund. On June 21, SAF Holland’s company picnic held numerous events to raise money for the 4-H Endowment Fund. A display table of information regarding 4-H was available for the employees to understand the mission and vision of 4-H. SAF-Holland raised $1000 and a check was presented to Muskegon County 4-H at the opening ceremonies of the Muskegon County Fair. Thank you SAF Holland for believing in the future of the Muskegon County 4-H Program and helping to sustain 4-H in this county. 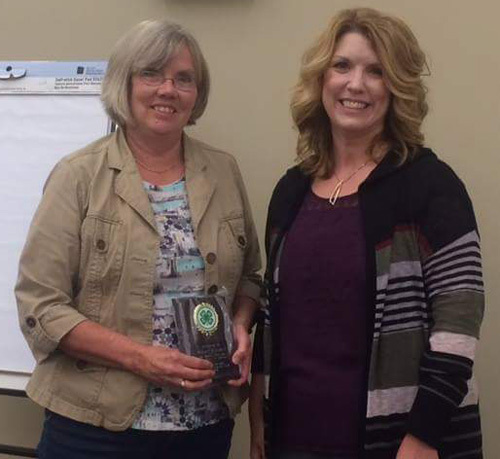 The 2016 Muskegon County 4-H Leader of the Year is Rhonda Gregory. Rhonda was a devoted 4-H leader and parent. She ran every 4-H club meeting, community service project, and activity the Denim N Dust club participated in. Even during her struggle with cancer treatments Rhonda was still always present and committed to her 4-H Club. She was always available to help any child or parent whenever they needed assistance. Her devotion, commitment, and friendships to 4-H makes her a perfect candidate for the 4-H Leader of the Year Award. She will forever hold a place in the Denim N Dust 4-H Club, the hearts of its members, and the 4-H community. Rhonda lost her battle with cancer shortly before the Fair in July. 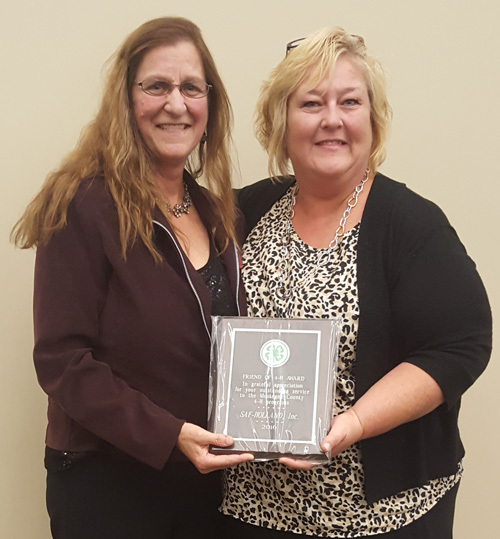 Rhonda will be honored and remembered always for the impact she made on the children and adults in the Muskegon County 4-H. Rhonda was from Muskegon. State 4-H Award – This is the highest honor bestowed on Michigan 4-H youth. This program is for 4-H youth aged 13 and up with at least three years of 4-H experience. 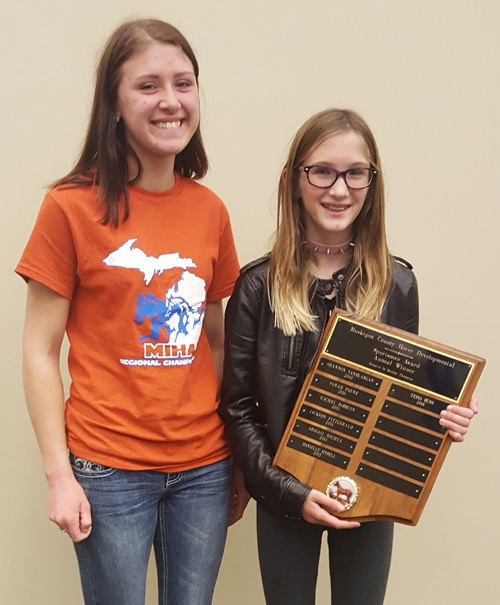 This past year Cassie Perrin from Coopersville applied for the State 4-H Award and was invited to be a State 4-H Delegate for the Sheep Science project area. I would like to recognize her for her hardwork and commitment to excellence. This entry was posted in 4-H on October 11, 2016 by editor.